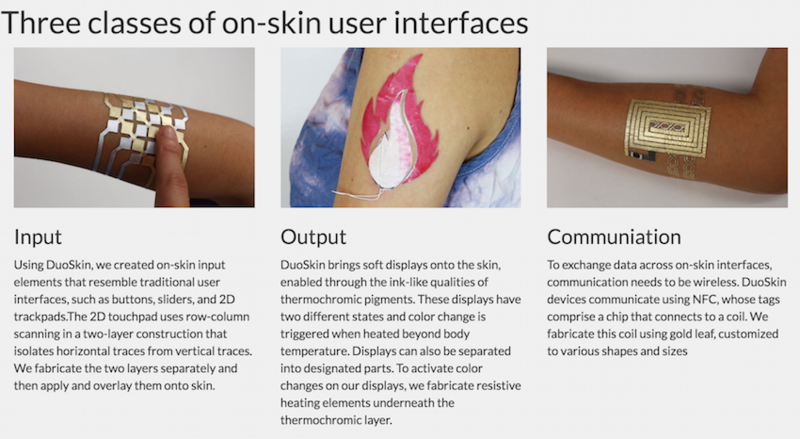 Duoskin is a pretty cool temporary tattoo interface created by MIT and Microsoft. DuoSkin draws from the aesthetics found in metallic jewelry-like temporary tattoos to create on-skin devices which resemble jewelry. 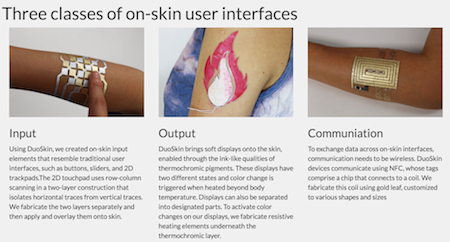 DuoSkin devices enable users to control their mobile devices, display information, and store information on their skin while serving as a statement of personal style. We believe that in the future, on-skin electronics will no longer be black-boxed and mystified; instead, they will converge towards the user friendliness, extensibility, and aesthetics of body decorations, forming a DuoSkin integrated to the extent that it has seemingly disappeared. thing by keeping the technology affordable, attractive and on-trend. Science fiction writers have, of course, anticipated all of the elements of the Duoskin control tattoos, the input tats, the output tats and the comm tats. The idea of an electronic tattoo or skin-sticker electronics device has been around for a while in science fiction. Consider the hand writer and the readout skin from John Varley's 1984 novel Steel Beach. I'd also mention Jack Vance's spray-on conductive film from his 1979 story The Face as an enabling technology idea. And don't forget about the palm flower from the 1967 novel Logan's Run. Another early wearable is the emotional register from Brian Aldiss' 1961 novel The Primal Urge. It describes the device as a small metal disk implanted in the forehead, which glows pink when the wearer is feeling sexual attraction. From Duoskin at MIT via WTVox.